Back in April, elobeatlesforever (elobf) hinted that a 2LP/2CD "Secret Messages" release, possibly without "Beatles Forever" was imminent in Summer 2018 so when the folks at Official Jeff Lynne confirmed it today (Tuesday 5th June), 35 years to the date when the original 1LP (JETLX527) came out in 1983, it came as no surprise to Yours Truly KJS that Friday 3rd August will finally see the issue of a "Secret Messages" double album (with digital download), albeit without a certain track. "For the first time ever, ELO’s Secret Messages will be released as a double album on August 3rd. Listen as Jeff Lynne’s eclectic creation of self-written, self-produced songs come to life as originally conceived in 1983. This 2LP release adds six tracks to its running order, all with cutting-edge synthesizers as well as up-front guitar mastery. 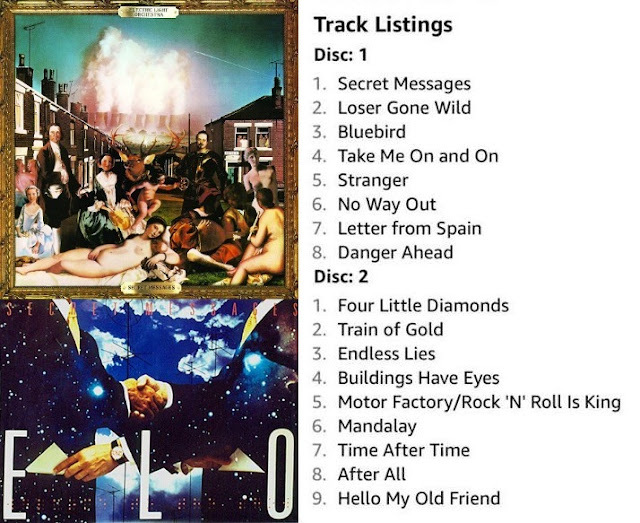 Pre-order here: https://lnk.to/SecretMessages"
elobf: Secret Messages 2LP & ELO Singles Box Soon? I can't find the Secret Messages 2cd confirmation on the official JL site, is it secretly hidden?? Your mission is NEVER complete. There really isn't much point campaigning to have Beatles Forever remixed into an instrumental, as Jeff took what he felt were the best musical elements of this song and used them in Video! just months after Secret Messages was ultimately released in single disc form. Anyway, it's not the absence of this particular track bothering me - I'm curious to know if we'll really get Motor Factory (which is the earliest of two scrapped lyrical ideas that were supposedly wiped from the original multitrack tape) or just Rock 'N' Roll Is King in the mix we all know and love. My guess is that whoever produced the official tracklist just copied whatever they could find online, since this particular variation is mentioned exclusively on the Wikipedia page for Secret Messages as being Jeff's intention for the 2LP set when this was never actually the case. Not complete KJS. No Beatles Forever...not an official release. Keep up the good fight...ELOBEATLESFOREVER Lives!! I wish all the ELO albums would get remastered AGAIN. The last time they tried it was either too compressed (objectively for the worse), or so cleaned up it sounded plastic (Sony ELO box set). If that does not happen, guess it's back to buying old original CD releases for me.